Bloop! There goes Facebook messenger. Who’s it from? An old friend from my table-waiting days, Carl. Pretty randomly, I might add, since I probably haven’t spoken to Carl since ’07 or ’08. I half expect the message to be one of those goofy chain letters or an animated gif he found amusing, but no, it’s something quite different. Carl wants to teach me how to make money from home. From there, Carl went into a spiel about a new, top-of-the-line weight loss shake powder he was selling. Of course, it wasn’t the powder that he was trying to sell me, per se, but the job of selling the powder itself to other people. After about 20 minutes of this, I wished Carl actually was pitching cryptocurrencies to me. As an Amazon seller, I had to give carl a pass. 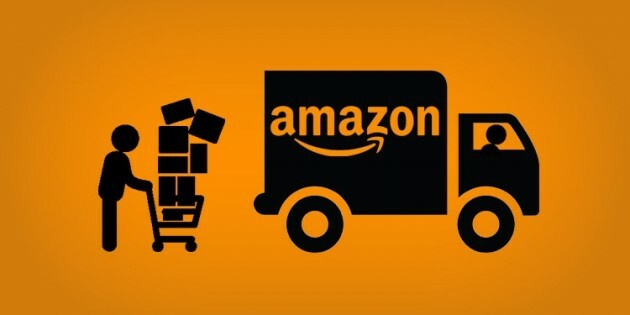 I’m a big believer that when it comes to shifting physical products, Amazon is the most lucrative way to go, with the lowest barrier to entry. I’ll explain why, but first, let’s take a look at MLMs. 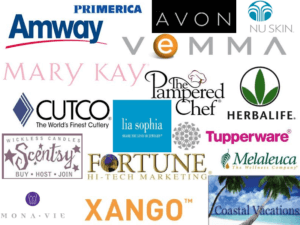 Multi level marketing, or MLM, is a form of direct sales home business in which independent representatives sell goods and services from a company to an end consumer. The multi-level aspect refers to each representatives’ ability to recruit and train other representatives, and earn commissions on their recruited reps’ (also called the down line) sales. Popular examples include Herbalife, Amway, Lularoe, and Rhodes + Fields. How to make money with a MLM. You can sell the products you buy to the end user. After all, you’re getting them at a “discount.” Often, the products are higher price points that what can be found on the high street. And then there’s the competition; you’re probably not the only one selling the stuff in your market. Plus, as a distributor, you need to create your own network of shoppers to sell product to. It’s not like you have a platform with millions of people ready to purchase like, on, oh-I-don’t-know Amazon (although, some distributors actually sell MLM products on Amazon, albeit at a crazy deep discount). You can recruit more people and earn commissions on their product purchases. Next up, and probably the most well known way how to make money with MLM, is through recruiting and making profit either on commissions paid on the the total purchases through your down line, or in the difference between what you’re buying selling the products for. This is the infamous “bug your friends to do what you do” part of MLMs that many of us are all too familiar with. Long story short, if you ain’t recruiting, you ain’t making money. And even if you are recruiting, it’s still not a certainty that you will be able to quit your job and work from home. Kinda like Carl. A common story in the MLM world. So, Carl got recruited and spent $300 in product. Then he worked to recruit two of his buddies into the organization (over 30 different people turned him down, by the way), each of them spending their own $300 to get in. But with only $900 total in products purchased between Carl and his down line, Carl’s commission tier was at a low 6%, so he earned a pitiful $54. Fortunately, Carl was able to move about 30% of his products to end users, but because of the tough market, he had to discount the goods at 35% off retail, so he made another $97.50 in revenue. Not to mention that these sales took him roughly 30-40 hours of bugging friends and family to get. This means that Carl, after subtracting that initial $300 to get things going, loss nearly half his initial investment. Unfortunately, it doesn’t get any better. Going into the next month, only one of Carl’s recruits stuck around. And Carl didn’t have any more friends and family to pitch, so he dug up old contacts–like that dude, Dave he used to work with 10 years ago. Oh yeah, and he then he had to buy another $300 in product to qualify as an active rep. And his end users churned roughly 75%, failing to re-up their purchases with him. That second month, Carl lost $250, and was now in the hole for $400. Plus, his garage was filling up with unsold products. Of course, this is just one example. Each company has different metrics. But this is a common reality for many people at these organizations. That’s not to say that some people can’t make the system work for them, but in a broader sense, only those at the tippy top are making the big money. According to author Jon Taylor in his book, Multi-Level Marketing Unmasked, 99.7% of people who do MLM don’t make money. That means only 3 out of 1,000 people who do MLM make money doing it. Or put another way, 997 people out of 1000 actually lose money doing MLM. 99.7% of people who do MLM lose money. If you’re asking yourself, “Why the hell would anybody would ever do this?” don’t worry, we’re right there with you. After all, we’re in the business of teaching people how to make money, not how to lose money. That’s exactly what I tried to do with Carl. Bringing Carl to the other side. After about three or four more pitches, I finally stopped Carl and told him that he needs to think about another business model. I told Carl about how I started my Amazon business back in 2015. Back then, all I had was about $500 worth of books I bought in a parking lot of a Carl’s Jr. (no relation) and my comic book collection. As sales came in, I continued to build the business and try out different methods of Amazon selling. Next, came retail arbitrage and online arbitrage. And eventually, I dropped those for private label. I used the Web App to find my winning PL product, how about you? That’s where I broke down the entire private label process for Carl. From there, I gave him one resource after another. Scott Voelker videos. Jungle Scout blogs. My own offer to coach. My first batch of private label products. 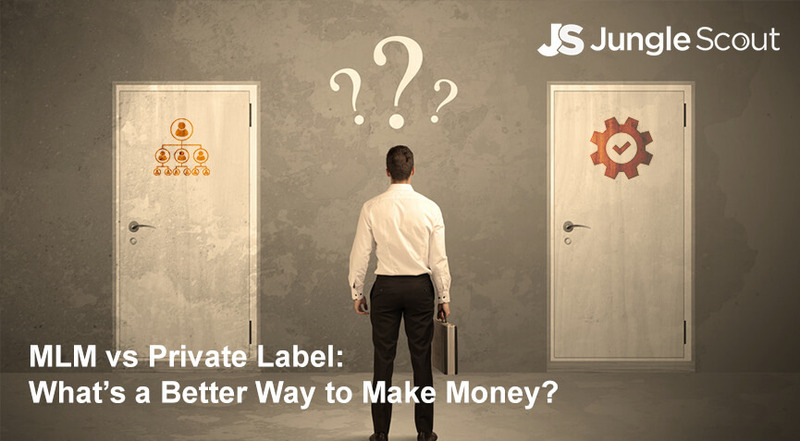 Amazon Private Label… a total no-brainer, right? When I first heard about Amazon private label and the kind of money you can make–my first private label product has made roughly $1500/month in gross profit since I first launched it in 2016 and my best-sellers do as much as $4,000 per month–I was like, “Oh hell yes. I’m doing this forever.” For me, it’s a total no-brainer. When it came to ways on how to make money, there was nothing that even came close to it. 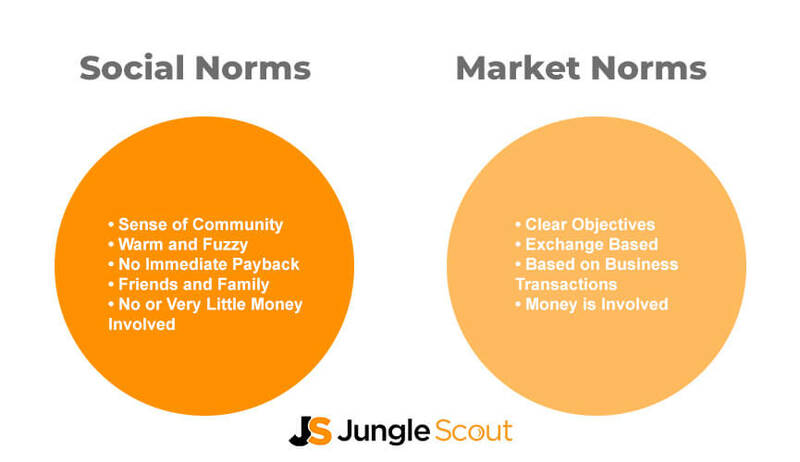 You can predict the sales that you’re going to have thanks to Amazon’s BSRs and Jungle Scout. Amazon does 80% of the hard work for you. They store, pick, pack, ship, and handle customer service all on your behalf and only ask for a measly 15-18%. It takes about four to five hours per week of effort to manage a 3-4 product business (once your products are launched, of course). You don’t have to recruit any warehouse staff! Let me type that again: you don’t have to recruit anybody! Plus, you do not have to rely on marketing to your friends and family on Facebook as Amazon has a huge audience of qualified shoppers ready and waiting for you. As an entrepreneur, Amazon private label is a dream. And MLM, frankly, sounds like a total nightmare. But to be fair, MLM is quite different than other money-making methods. In fact, multi-level marketing and entrepreneurship exist in two entirely different worlds. MLMs exist within a world of social norms. 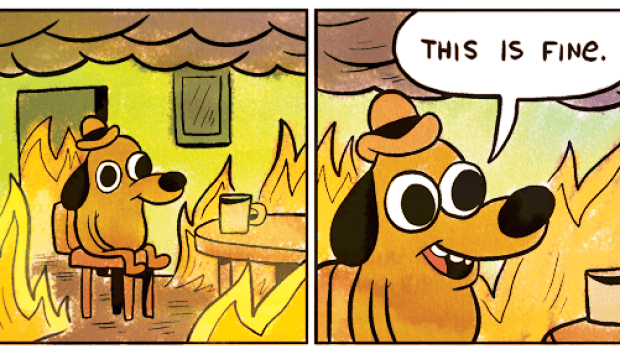 Meanwhile, entrepreneurs exist within the world of market norms. 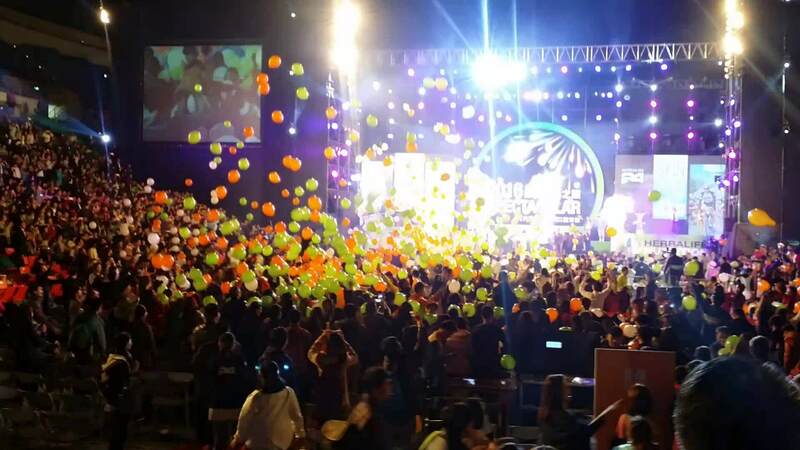 One of the crazy rock-concert-like events put on by Herbalife. This fits in perfectly with the MLM world, where it’s normal for the founders to throw rock concerts for the community and send out inspirational videos. It’s all about being a part of something big. Is being part of a social norm a bad thing? There’s absolutely nothing wrong with being part of a social norm! Humans are social beings. It’s what’s kept us together since we were painting on cave walls and helped us get to where we are today. And not everyone is motivated by things like financial freedom, high net worth, and the ability to create things. Many simply want to feel the “warm and fuzzy” sensation of being part of something. Amazon Private Label isn’t perfect… but darn close. Amazon’s platform, Amazon’s rules. While Amazon does give you access to literally billions of customers, in the end those customers are Amazon’s customers and you have to respect that. Fortunately, most of this is just common sense customer service. 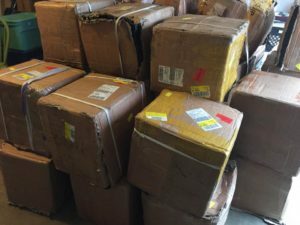 You have to learn a little bit about logistics and product development. Of course, with a resource like Jungle Scout and all of our free courses and helpful coaches, that’s easy. There is a cost to get started with Amazon private label. However, there’s tons of ways to get around those, too, with platforms like Kickstarter and Indiegogo. Plus, you could even get started on Amazon with another selling method like arbitrage or wholesaling. Sourcing and importing can be intimidating for a new seller. However, Alibaba (our go-to product source platform) has been around for 20+ years and makes the process super simple. It’s not a get-rich-quick scheme at all. It takes patience to get a brand up and running. But unless you were lucky enough to buy $1000 worth of bitcoin in 2012, it offers some of the best returns-on-investment I’ve ever seen. No “free” rock concerts. Guess MLM has us there. How to make money: comparing MLM and Amazon Private Label. On the other hand, if huge profits, your own brand, and the freedom to do whatever and go whereever you want is attractive to you, check out Amazon private label. Of all the ways I know how to make money, it’s been my favorite for a long time. More information on Private Label selling (TL;DR). Amazon Private Label is a process of creating your own branded products to sell on Amazon. The average product, researched and sourced correctly, should earn between $8-$12 per unit and sell 300 units per month (average product brings in $3,000/month in gross profit). Furthermore, Amazon’s fulfillment network does all the storing, picking, packing, shipping, and handling customer service on your behalf, so it doesn’t take a whole lot of effort. Finding a product that is HIGH in demand and LOW in competition doesn’t have to be hard, yanno? If you’re interested in learning more about how to make money with Amazon, then here, at Jungle Scout, we offer free information on the process of researching, sourcing, launching, and marketing private label products. Check out The Genius Series below. Hope people see that this article is written to get people into Amazon sales. That`s ok to recrute for that, But it`s not ok when the article first slaughter MLM. The way this person or maybe it`s Amazon it`s self tell what MLM is and how bad it is , is totaly wrong. People should stop beeing negative to MLM and learn about it. It`s not for everyone, and Amazon is not for everyone. Let people find what fit their personality, but stop telling how bad network marketers are. They are helping a lot of people to make an extra income and many to make very much money. Thanks for the feedback! The research I’ve done and people I’ve spoken to tend to lean in the direction of it not working well for those who try it. Of course, that’s just one sample. And the article does say that if you want something that’s more community-driven and less about financial success, then definitely look towards MLM. Thanks a lot. I am justing getting started forming my Amazon business and the more information I can gather the better. Excited to learn all I can! !